Quezon province stretches like a narrow belt along the eastern coast of Luzon. It borders the provinces of Aurora to the north, Camarines Norte and Camarines Sur to the east, Bulacan, Rizal, Laguna and Batangas to the west and to the south, the province divides into two Tayabas which projects into the Bondoc Peninsula and the other end curves towards the Camarines provinces. It has a total land area of nearly 12,000 square kilometers, consisting of 40 towns with Lucena as the capital of the province. Polillo group of islands is located in the northeast of Quezon Province. Polillo, Patnanungan and Jomalig are the three big islands facing the Pacific Ocean. These islands are not yet well-developed except for Polillo, the biggest of the three island, which also have a tourist hotel and resort name Sea Horse and Balesin . For many non-adventurers, they only get to hear about the island when there is a typhoon coming because it is used as a reference point by the weather bureau. 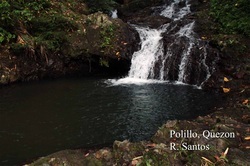 But among conservationist, whether local or foreign, Polillo is one haven worth exploring and preserving. In recent years, environmental groups have tried to cultivate among the residents of the island the ecological benefit of protecting different species of birds, animals, fishes and faunas. The people of the island responded overwhelmingly, thus, sanctuaries where provided to keep the irreplaceable species from extinction. For the photos of the species found in the island, you may visit www.mampam.com. We met the website owner in 2004 while visiting his study site inside the island's forest. The quality of peace on Polillo is like a little prayer that you cast each dawn of the day. It brings serenity and warmth that slowly elude major cities in the country. The people in Polillo value family, traditonal customs and friendship. Before one can reach Polillo Island, you must go to Real, Quezon. There are three ways of getting Real, Quezon. First, from Shaw Boulevard, take a jeepney going to Cainta junction. From Cainta junction, take another jeepney going to Siniloan, Laguna. Then another jeepney ride in going to Real, Quezon. Second option is to take the scenic Sta. Cruz, Laguna route. You can take a bus at Buendia and Cubao terminals. The travel time is around 2 hours. Then, from Sta. Cruz, take a jeepney going to Siniloan. From there, you can take a jeepney going to Infanta/Real, Quezon. From Garcia St. in Real, take a tricycle going to its Ungos port. The travel time is around two hours and a half. The third option is to go to Legarda, Manila and take either Raymund bus (tel. 7339380) or a van going directly to Real, Quezon. The bus terminal is near Arellano University. The bus that directly goes to Ungos port leaves at 11:30 pm (ordinary bus) and at 1:00 am (aircon bus). The travel time is roughly 4 hours. It is important that you arrive early at the port because the boats leave in the morning. 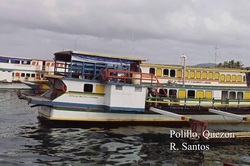 There are only three boats that traverse Real-Polillo route and vice versa. The schedule of Real-Polillo are 5:30am, 7:00am and 9:00am while the Polillo-Real boat leaves at 5:00am, 11:00am and 1:00pm. The boat ride takes three hours. There are only a few accommodations available for travelers. 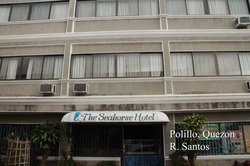 These are the Seahorse Hotel (tel. nos. 02.6340016; 042.3148170; 0921.4606398); Herrera Plaza Lodging House (mobile 0998.2602928) and Casa Escarlata Hotel. The difference would depend on its facility like having communal toilets and baths and a restaurant. These accommodations are walking distance from the port and are located along the main street. It is difficult to exactly recall all the names of places that you can actually visit. All you need is one good guide and you will remember the sceneries far more beautifully than you can utter their names. The island is blessed with warm individuals and cool places. It is therefore up to the traveler to discover the different wonders of the islands like falls, caves, forests, water shed area, and fish and bird sanctuaries. They have a lush green forest where you can see the different species of birds and animals, some of which are endemic to the island. They have a number of beautiful beaches as it is surrounded by water. In going to these places, it is important to go there early in the morning because some place entails walking or riding for four hours. There are beige-sand beaches in the coastal areas with low-lying mountains in the background. A beach named Bigyan has an impressive formation of mangroves and corals. Some known resorts are Azaulas, Balesin, British Beach Resort, Isla Fishing Resort, and Panganiban. The San Francisco beach is about a kilometer hike from the Polillo Pier. It is ideal for travelers seeking fun under the sun, where fresh sea breeze never fails to blow and lovely cottages line the beach. Barangay Sabang is another promising tourist spot with its clean golden beaches, coconut plantations, and abundant fishing grounds. The other beach destinations are Brgy. Bucao; Kokok-Canicanian; Kalubakis; Bakaw-Bakaw, Pamatdan; Anawan; Danao and Agta. Tamulaya Falls is believed to be enchanted and home to the dwarves and elementals. Another well known site is Minasawa, a bird sanctuary where several bird species can be found. Past Polillo town is the town of Burdeous, a place which has a rich history. The place was originally called Visita, then changed to Bordeaux, and later Burdeous by the priest who presided the first-ever mass in the barrio. To date, people carry on with traditional customs of celebrating their fiesta, which they have observed since pre-Spanish times. Burdeous is entry point to the smaller islands and islets. In going to Burdeos, you have to take either the jeepney (travel time 4 hours) or rent a motorcycle (travel time 3 hours) due to the worst road condition. If the local government could only pave the road, it will only take an hour to reach the municipality of Burdeos. Here you will find wide beaches, timberlands, aquamarine waters, sandbars, bird sanctuaries and game refuge. Another interesting destination is Jomalig, which originates from the word "humalik" meaning "to kiss." Jomalig is a solitude of beauty known for its blue coral beaches, wildlife and lots of seafoods including lobster that can be obtained all year round. Its boundaries are Patnanungan Island in the northeast, mainland in the southwest, and the eastern side of the vast blue Pacific Ocean. A favorite among business executives, this island offers a wide variety of white beaches and islets. When you are in the island, the modes of transportation are pedicabs, motorcycle, jeepney and tricycle. No rural bank and automated teller machine in the area. Only cash transactions are accepted. One afternoon by the bay in Polillo, help us notice that here, the sea does not exercise a dominant presence rather the peace and calm that the site brings. The fishing boats along shore, children playing along stretch of beaches, and the flock of birds that now head home towards their sanctuaries. As the sun sets in Polillo, the scene will forever bring serenity and calmness as we have witnessed how the world becomes the sea and how the sea becomes the world.